Had an unpleasant experience or unforgettable 'when' question? The word 'when' can indeed be a word which is enough to make life not calm. As the story is expressed in the article "Not All People Able and Agree to Marry Young" is. Basically, you're never alone facing anxiety and anxiety over 'when' questions. Married young is considered a trend lately. Many people are abusing the meaning of marriage itself, follow-up friends, which is important halal. Getting married is not a trend to be followed and not as easy as downloading apps on smartphones. Married requires a lot of readiness, especially mental. Maybe a lot of people which leave this mental preparedness factor because financially more exalted than anything else. Including my parents, who always urged me to get married. The "when" question becomes something more horror compared to the astral creatures out there. The reason, as a woman we have to go through the "when" question level. "When was the graduation?" I was graduation. Now must face "when is marriage" which I also do not yet know the answer to that question. I'm just 24 years old and for me, it's too young to get married because there is still much to accomplish. As the eldest son must be satisfied with many demands from parents since childhood. Sometimes I think that they never realized that I am human, is not a robot that can grant all these demands in an instant. I do have a lover and has been in a relationship for 21 months. Koko, I call him, he has the ideals of wanting to marry young. Currently, he is 26 years old. Since our first meeting, he already told me that he wanted to marry me. My response is just, "Let's go first,"
fortunately, he understands and receives it well. Our family knows our relationship and they look "welcome". Koko, often I meet my family, with the intention he can adapt and know about my family. "So when are you married?" Asked one of my uncles, I immediately replied with a joke, "Just a month immediately asked the marriage, be patient." It responds to the "when" still with normal. At home, I am every day heard the question until now. The thing that worsens the situation is my mother always compares herself to being married at the age of 23. I always argue past and present are two different things. I don't want my mind closed and back to the time when he was married. I do not want to be equated because I have my own way, I have a reason why I'm not ready to get married yet. For me, before getting married must have known before entering into it. I have to learn the meaning of marriage itself, understand about rights and obligations as husband and wife, improve yourself for the better, how to be a good parent for his son someday, and many more. I'm very concerned about how to be a parent and child growth recently. And this is my reason I'm not ready to get married yet. Become that parent is a tough job, and learn to be that parent lifetime. I understood once to be the eldest son, we are required many things from understanding parenthood, succumbing to his younger siblings, should be a good example for them until it becomes a substitute for our own parents. Koko and I are the eldest sons, a little more we have in common are getting parenting from our respective parents. I tried to explain my reason to him. I want to break the incident in childhood so as not to recur when I was a parent. I do not want to do verbal abuse and physically to my son someday. Educating children requires their own techniques and can not be applied to all children. I and Koko are a result of trial and error of our parents and I do not want our eldest son later becomes trial and error as well and so on. Not many people understand sometimes the "when is marriage" question can be very painful. Once, twice I can deal with it. If it goes on and on we will become uncomfortable plus during the holidays. The more you meet people, the more questions we receive. Maybe they do not understand how are the words can destroy the soul even depress others. Each gets an invitation from my friend, my mother immediately took out her jutsu. "Look at this, they've got married, great yes he. Mother heard her dowry 100 grams of gold. Yesterday also a child in the next complex it can be 50 million fitting deliveries, yesterday it leased the building same decoration, cheap, " etc. All I do is I'm silent, take a glass of water then leave. As I said before, I care more about post marriage. Maybe he was given Rp50 million, we never know it is lawful or not, or it might get lost in an instant. We never know that and not our personal affairs. Marriage issues as well as death, because of sustenance, mate and death is God's business. It could be when we are asked when marriage then we again ask "when is dead?" Surely those who hear will be hurt too. So also with when marriage, that's God's business. Everyone has his time respectively and no need to fret about it. I might get married this year but I can not directly have a child, then got the question, "When have children?" I might get married next year and directly given the child and afterward got the question, "When has a sister?" Stop asking "when" to others, it can be very painful. Get the demands from parents is the heaviest burden in my life. The reason they want that best for his son, but never understood the state of his own son. Stop comparing us with other people, comparing married at a young age, achievements that he achieved, living in a mansion, have twins and so on. Taking care of each other is more useful than to hurt the hearts of others. I have my reasons and I still believe in God's promise, not losing direction. Getting married is a dream a girl who is old enough. However, until various questions were getting more and more day making the heart unstoppable. So also when looking at friends who are happy with his little family. "Well, they're so happy," I thought to myself. Whereas I'm here who is still faithful to my solitude accompanied by my busy life. Must be willing to plug the ear anywhere and anytime to answer about when married? Lecture already, work already? Age is enough to get married. Well, now is the time to get married. Come on not too selected, intentions to choose so unselected people. Just like that always. I consider them as faithful observers that every day always looking for the latest info about me. Trying to think positive. They are casual talking without thinking what is the effect of their talk, but that's human. Always looking for other people's shortcomings. Hearing that I was originally upset, angry, minder but because it is too often heard the question was me calmly and a smile replied, "Yes. Yes please pray for my soul mate, yes to be sent as soon as possible by the Creator, " or answer me, "My mom is still on the way over here." Married is the longing of every human being which is still single but by no means due to the high age make us think so so. Human beings are rational just natural to keep choosing which one best to be his companion for a lifetime. 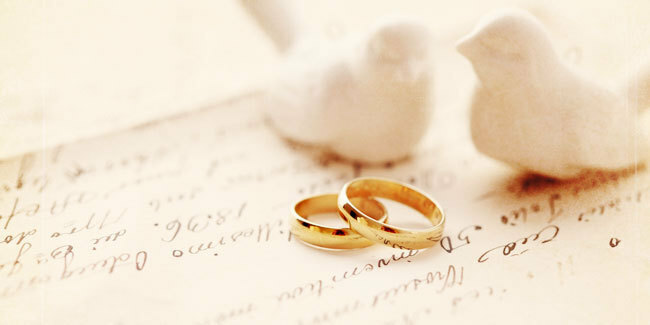 Because marriage is not a game which is already tired can be replaced, but it is a one-way ticket us to the happiness. When you choose wrong then you will suffer for the rest of your life. No reason for me to not make sense of life with gratitude, although we as human beings usually very often discouraged when we are questioned with some of the cliche questions. But that's not the reason for us not to try. Let's still try to plant goodness to get the best. Know, there is already a set of the soul mate. Our duty man to improve himself to await our answers to prayer. Not now but be assured of His promise. One day he will meet you with your soul mate at the right time in the right way.